why didn’t my recipe work?? Italian plums and French brandy come together for an easy American fall dessert. The temperature of recipes are often incorrect. Most modern ovens that are fan forced operate at 160c , i picked up a recipe the other day and it suggested 190c . That is a very high temperature that will overcook the cake. Trust your own judgment and get a feel for your own oven. Cake tin size is imperative. I followed a recipe that asked for a large tin but when i mixed the cake it only made a smaller amount. Cake mixture should always be at least half way up the tin. I f the mixture is too big take some out or use a larger tin. Cooking times are very variable. they are affected by the moisture of all products . in a cake for example if you add more fruit it could take longer. Don’t be afraid to open the oven, it won’t hurt the food ,unless it is a soufflé !! I love to entertain but some times lack the time to pre prepare the food so am always on the lookout for something I can easily whip up with a few ingredients that are always in my pantry. Those ingredients are Chocolate (mostly I try to hide this from my children !!!) , Coffee, Eggs and sugar. It is easy to prepare, takes no time to make and is a delicious light desert that is beutifully matched with steamed fruit or fresh berries. Simply melt 200g Chocolate with 100g castor sugar and 100ml espresso coffee in a double boiler or in a bowl sitting over simmering water. Once melted beat in 4 egg yolks . 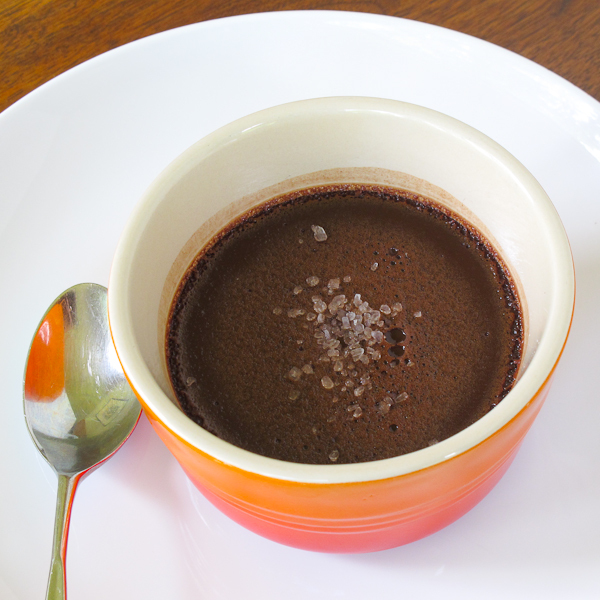 Place into a small china cup or souffle mould with around 50 to 60 mls. Cover with baking paper or with foil. Steam for around 30 minutes . This past week has been very challenging for my teenagers and might i say all of us because our internet was cut off , we lost a phone bill and didn’t pay it !! Actually the internet wasn’t cut just slowed to a snails pace. Like losing power one does not realise how much we depend on a service until it is gone !! Fortunately I love reading and buried myself in a book i picked up from the op shop called “The cure for death by lightning” by Gail Anderson-Dargatz. It is a beautifully written story about a farming family set during the second world war. The mother of the main character is a fine cook and records all of her recipes in a scrapbook. Paper was very hard to come by and this special book of recipes and tips was pasted onto any scrap that came into the house. Peel and remove the cores in such a way that the apples are left whole. Any apple will do, green apples will make a for a tarter taste.Arrange the apples in a deep pie dish, as many apples as you have guests or that your dish will accommodate .Mix a batter with three eggs and enough milk and flour to make a little on the runny side.Pour it over the apples, filling the hole where the core was, and the deep dish. Bake in a hot oven , about 180c until the apples are cooked and the batter is brown.Serve with a sprinkle of brown sugar and a bit of butter. I love the taste of freshly steamed vegetables .The true taste is often preserved and I like my veggies crunchy with no oily taste. 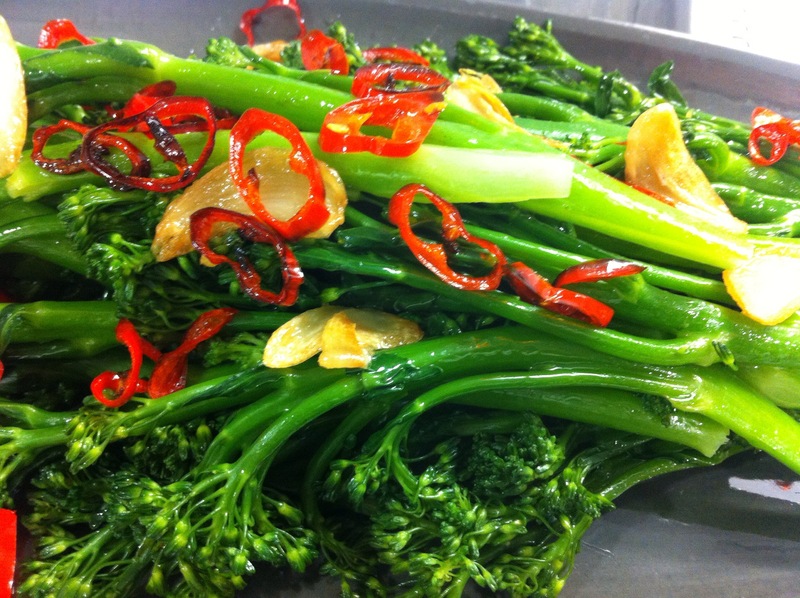 However sometimes vegetables on their own are just plain boring and need a little flavour to make them go from boring to inspiring ! 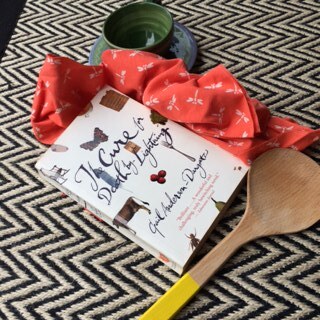 This week I invited a friend Graham to dinner. Graham is a very fine cook and is always keen to try cooking and eating new foods. Whilst shopping in our local little vietnamese area “” little Saigon” he picked up some very delicious Sydney rock oysters, as well as some sea urchins. He gave me a quick ring and asked if I was up to the challenge of preparing a new food. I certainly was very curious about what was going to arrive and knowing it was purchased in the market that is called “Little Saigon” I guessed that it would be probably be a seafood. I have tried sea urchins before during a boat ride around a greek island. The fisherman simply lifted one out of the water cracked it open and we all tried the roe. I didn’t have fond memories of it or the texture !! This time Graham opened the first sea urchin carefully (they are quite spiky) and removed the roe , a pale soft mustard. We squirted a little lemon juice over and I was enraptured ! The second and third urchins had a completely different flavour and I didn’t enjoy them at all. It shows how important it is to keep trying new things !! On Sunday I was asked to give some cooking classes at South Melbourne market. I jostled with a few different ideas. It has been soo cold in Melbourne and the food we eat when it is cold becomes even more important. Should it be slow cooked meals ?? Perhaps hearty soups, but in a moment of needing sugar we decided on winter deserts!! 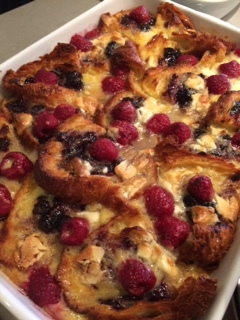 Over four hours we cooked chocolate steamed pots, cherry clafouti, Pear and Almond tart, but the all time favourite was white chocolate, croissant and raspberry pudding. This pudding is a fancy take on the good old fashioned bread and butter pudding that our mothers made ,to help keep hungry stomachs happy.Then my mother made the pudding with simple white sliced bread, but I prefer to use either a good fruit bread or left over panetone. I have even been known to store one in the freezer from christmas so I can whip up this treat in winter. open just a week earlier and her croissants are amazing. They are light buttery and crisp !!! I cut the croissants into half , spread with a nice berry jam and then cut them into four smaller pieces.Place these pieces into a heat proof dish. 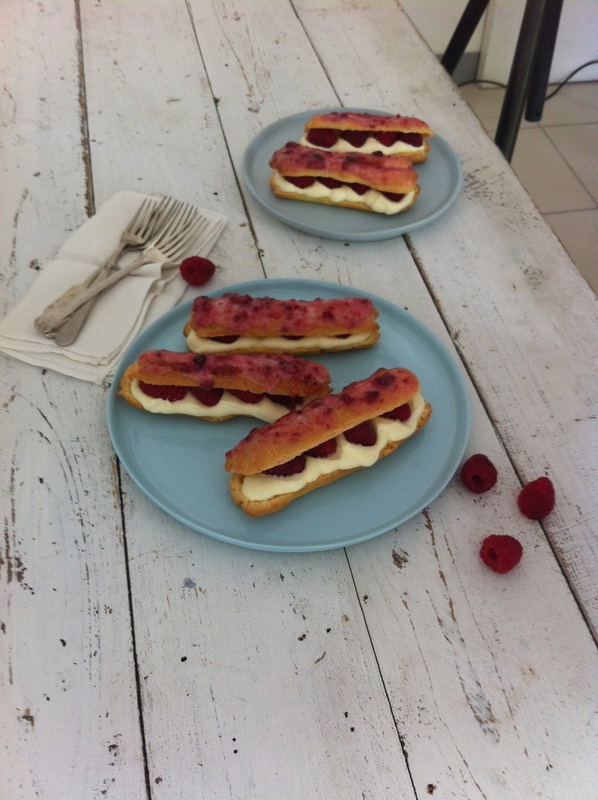 Dot the croissants with raspberry’s and small pieces of white chocolate. The quality of your chocolate will always have an impact so lindt is best. Heat 425ml cream and 100g castor sugar until the sugar has dissolved. When this mixture is cool whisk in 4 eggs. Pour this mixture over the croissant and rest in the fridge for at least two hours. This step allows the croissant to soak up the custard . Bake in an oven at approximately 180c for 35 to 40 minutes. Allow to stand for at leaf 10 minutes before serving.